You may be looking for the Halo 2 level The Heretic or the machinima of the same name. "The Elites are blind, Arbiter, but I will make them see." Sesa 'Refumee was the leader of a group of heretics who had defected from the Covenant and taken control of a Forerunner gas mine over Threshold and a small outpost on Basis, the gas giant's moon which Installation 04 rested between. "I wondered who the Prophets would send to silence me. An Arbiter? I'm flattered." — 'Refumee to Arbiter Thel 'Vadamee. Sesa 'Refumee meets 343 Guilty Spark. In September 2552, Sesa 'Refumee led an artifact retrieval group within the Fleet of Particular Justice alongside Loka 'Bandolee. After the fleet arrived at Installation 04 in pursuit of the UNSC Pillar of Autumn, 'Refumee's expeditionary group was sent to study a Forerunner gas mine above Threshold at the behest of the Prophet of Stewardship. Supreme Commander Thel 'Vadamee disapproved of the mission, believing that all military forces needed to be concentrated on the human forces on the installation. As such, 'Refumee was not on Installation 04 when John-117 detonated the Pillar of Autumn's engines, destroying the ring. However, when most of the Fleet of Particular Justice had been destroyed or left the system, Sesa 'Refumee and his forces were left stranded on the gas mine facility. Sesa 'Refumee and 343 Guilty Spark converse. After Alpha Halo's destruction, Installation 04's monitor, 343 Guilty Spark, travelled to Threshold's gas mine shortly after the Halo's destruction. The monitor encountered initially hostile Kig-Yar soldiers that were a part of 'Refumee's unit. However, a Sangheili soldier found the monitor and brought Guilty Spark to 'Refumee. The monitor "edified" him about the true nature of the Halo Array, the fate of the Forerunners, and the origins of the Flood. Realizing that the San'Shyuum's teachings were false, 'Refumee cut off communications to the remainder of the fleet. 'Refumee and Guilty Spark had a lengthy conversation over the history of the Covenant and the Sangheili. He initially considered conveying these revelations to his commander, Thel 'Vadamee, the only individual that he felt he could trust with 343 Guilty Spark's revelations. However, Thel's disgrace and appointment as Arbiter prevented any detailed conversations. 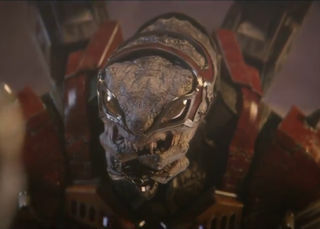 'Refumee subsequently led the Sangheili, Kig-Yar, and Unggoy under his command to revolt against the Prophets. 'Refumee then proceeded to fortify the gas mine with defenses, anticipating a response from the Prophets. He attempted to spread the truth to the rest of the Covenant in hopes that others would rally to his cause, which infuriated the High Prophets of Truth and Mercy. Sesa was branded a traitor and a heretic by Truth, who sent Thel 'Vadamee, the newly appointed Arbiter, to execute 'Refumee and to quell his heretical movement. At first, 'Refumee tried to protect himself by releasing the Flood in specific areas to kill the Arbiter and his strike team, but this backfired and 'Refumee's followers were forced into a two-sided war. In the meantime, a perilous and lethal storm raged outside. Hoping the storm would kill his pursuers, 'Refumee sealed himself within an impenetrable protected zone of the station. To force 'Refumee out of hiding, 'Vadamee cut the cable that prevented the station from falling into the gas giant. As 'Refumee attempted to make his escape in a Type-31 Seraph fighter, the Arbiter found him and demanded to know the source of 'Refumee's heretical beliefs, causing 343 Guilty Spark to show himself. Though the Monitor began attempting to edify the Arbiter, 'Refumee decided to attack him rather than attempt to convert the Arbiter to his side. Despite 'Refumee's clever use of holo-drones, 'Vadamee soon killed him and retrieved 343 Guilty Spark from the station. With the death of 'Refumee and most of his followers at the hands of the Arbiter, and with 343 Guilty Spark in the hands of Tartarus and the Hierarchs, the heresy was quelled. However, after the Arbiter was presented the same message by the Gravemind, John-117, and 343 Guilty Spark, he slowly came to believe it. Consequentially the ideals that Sesa 'Refumee's faction promoted were later revived during the Great Schism by the Covenant separatists. For all intents and purposes, Sesa 'Refumee, on his own, is just a Sangheili Ranger with differently-colored armor and shields that could withstand up to two energy sword lunges, making him accurately comparable to a Sangheili Ultra. He utilizes two holo-drones to assist him in a fight and as a method to stay away from harm's reach. These holo-drones, when projected, create two identical models—albeit a darker armor tint—of himself, which deal real damage upon the player. When a holo-drone is "killed", the model will dissipate and the holo-drone ball will simply drop to the floor. On higher levels, defeating the first drones will make the real Sesa fly into one of the pipes and several more drones will appear. However, the real Sesa will often hide in one of the pipes on the top of the room. He will not respond to damage and can be easily killed with a Covenant carbine or Needler. Check out our collection of quotes related to Sesa 'Refumee in its quotes page. Sesa 'Refumee is voiced by Miguel Ferrer in Halo 2 and by John DiMaggio in Halo 2: Anniversary's terminals. His voice actor in Halo: Combat Evolved Anniversary's terminals is uncredited. Even though 'Refumee left the Covenant, he did not remove the "-ee" suffix from his name, which denotes service in the Covenant military. Out of universe, this is most likely a result of his name having been given before Halo: The Cole Protocol established the meaning of the "-ee" suffix. Despite considering Thel 'Vadamee the one person he could trust with 343 Guilty Spark's revelations, when granted the opportunity during his final confrontation with Thel, he instead used Spark's appearance as a distraction rather than trying to use the "Oracle" to convince Thel of the truth. An early model of 'Refumee for Halo 2: Anniversary. 'Refumee learning of the Prophets' lies. Alongside 'Refumee, 343 Guilty Spark discusses the Halo Array. 'Refumee firing his plasma rifles. 'Refumee engages the Arbiter in Halo 2 Anniversary. Sesa 'Refumee examines a plasma rifle.